In my last post, I tackled Dr. Plantinga’s question regarding faith as a scientific hypothesis. Plantinga seems to question the thought, but as I demonstrated in the last post, the great prophet Elijah did not seem to oppose the idea that faith be treated as a scientific hypothesis; rather, faith could stand up to the gods of this world (1 Kings 18). This explains why Elijah proposed the experiment he did. The result? God vindicated Himself by sending fire to consume all the 12 waterpots of water that had been poured on the altar. God is the God of the physical elements, and it is much to our shame when we do not allow God to show Himself to the world by placing our faith behind a glass cage and saying, “You cannot attack it.” If our God is the one true living God, I think He can handle the attacks. When we refuse to allow our faith to be attacked, the weakness of Christian belief does not lie in God but in us. This statement came right after Dr. Plantinga quoted John L. Mackie’s statement about how Christian belief cannot be rationally defended. Mackie is an evidentialist objector, someone who does not believe that there is evidence for a Creator. In the last post, I agreed with Mackie---since God is not subject to a test tube (is not “directly verifiable”), God can only be validated in the world through logical arguments and propositions. Plantinga disagrees with this and thinks that by labeling faith as a scientific hypothesis, one gives too much credit to the scientific world. However, as I’ve argued in a prior post in this series, is not God the Lord of heaven and earth? Did He not create the earth? If He did, and He is Lord over the physical elements, then science will only manifest His presence, right? If He truly is Lord, science will not oppose His existence, but confirm it. Why are Christians today so afraid of conducting science to demonstrate God’s existence? Are we afraid that we might find something to “disprove” His existence? If this is why we have cowered away from the atheistic objections, it’s only because the intellectual weakness lies in us, not in God. As my tenth-grade teacher Mrs. Blevins once said to a classmate of mine, “It sounds like a personal problem.” I would say that the same statement applies here for individuals that are scared of what science could offer. In this post, my task is to present the view of faith and science from the perspective of the earliest Christian scientists. For those of you who are interested in the earliest Christian scientists and how their faith in God impacted their scientific work, see Charles Thaxton and Nancy Pearcey’s The Soul of Science: Christian Faith and Natural Philosophy. Some of Thaxton and Pearcey’s work will be presented in this post. But this is beside the point in the current discussion, because I never affirmed a possible prioritization of faith and science. I never stated which came before which in the order of relationship; rather, I simply stated that faith and science were mutually compatible. What I mean by mutually compatible is that both work together, not against each other. And let’s suppose that Plantinga’s view is right and faith does come first; does that still negate the importance of scientific experiment? No. Faith can still come first, while subjecting itself to scientific experiment. This occurs in 1 Kings 18 with Elijah and the Baal prophets at Mount Carmel. Again, this does not endanger the evidentialist view. It’s fine to have faith; evidentialists such as myself believe, however, that faith alone is mere irrationality. Rather, faith must be combined with evidence...or else it is of no use to anyone. “The chief aim of all investigations of the external world should be to discover the rational order and harmony which has been imposed on it by God and which He revealed to us in the language of mathematics” (Johannes Kepler, quoted by Nancy Pearcey and Charles Thaxton, The Soul of Science: Christian Faith and Natural Philosophy. Wheaton: Crossway Books, 1994, page 126). Science was an undisputable, undeniable tool for the Christian scientist, according to Kepler. The sole purpose of conducting science was to demonstrate the existence of God. Contra Plantinga, Kepler believed that faith could be deemed a scientific hypothesis. “this most beautiful system of sun, planets, and comets could only proceed from the counsel and dominion of an intelligent and powerful being” (Newton, quoted by Pearcey and Thaxton, The Soul of Science, page 72). Why is it that Newton believed the Creator of the world was “intelligent”? Because the physical world reflected that intelligence. The mark of intelligence could only be left by an intelligent person. Only a person can produce a magnificent painting, write a book, type a sentence, draw house plans, etc. If the physical world appears intelligent, then it is so because of the Creator who made it. If humans did not create the world we see (and the physical world bears the mark of intelligence), who else could have made it but an Intelligent Designer? Newton also stated in his work Opticks that the purpose of science is to “deduce causes from effects, till we come to the very first cause, which certainly is not mechanical.” For Newton at least, science served an apologetic purpose. As Pearcey and Thaxton note, “Newton wanted his work used for apologetics” (Soul of Science, page 41). “If Christian belief were truly a barrier to science, it is difficult to explain why so many founders of modern science were believers. Paracelsus, Boyle, and Newton wrote extensively on theology as well as on science. Others---Kepler and van Helmont---filled their scientific notebooks with prayers, praise, and theological musings...many of the earliest scientists studied creation in an effort to know the Creator. Later, when religious skepticism was on the rise, many scientists hoped to use scientific discoveries to buttress religious belief. Newton wanted his work used for apologetics...Mersenne and Descartes...were actively concerned to furnish new weapons to defend religion at a time when the old arguments seem to have been discredited...to omit or dismiss these religious motivations is to misunderstand the true nature of science” (Pearcey and Thaxton, The Soul of Science, page 41). The fact that “so many founders of modern science were believers” testifies to the idea that science is not opposed to faith, nor is faith opposed to science. 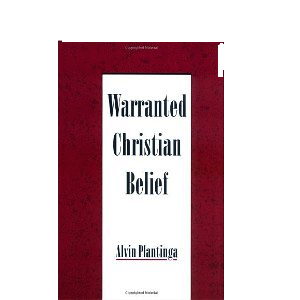 The earliest Christian scientists would have disagreed with Plantinga’s statement that Christian belief need no argument or evidence. Also, the earliest Christian scientists lived in an age of religious skepticism and used science “to buttress religious belief.” Why did they use science? Because “the old arguments seem to have been discredited.” In my mind at least, the old argument about faith as simple belief was not enough to convince the skeptics of their time. This is one of the problems with Plantinga’s system: one can be personally justified in their belief, but what purpose does my faith serve in aiding the unbeliever? None at all. And if all I’m concerned about is my faith, then I can accept Reformed Epistemology. Fortunately, I care about the unbeliever and pray that he or she would come to Christ. I will continue with more on this subject in my next post.